The Wilsons, 2016: David and Kathy Wilson, with Joshua, Daniel and Hannah. 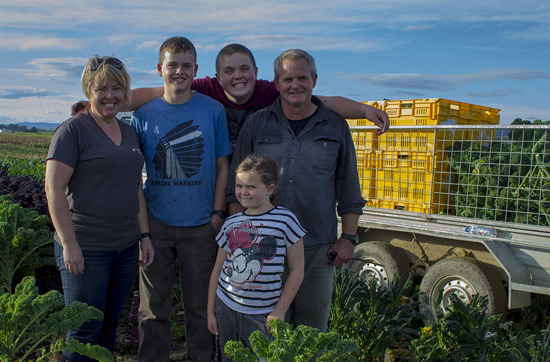 The selling of vegetables from Wilson’s Crossing on SH6 began in 1975 with a wheelbarrow filled with Swedes at the roadside – just some pocket money for the children from a rural family. 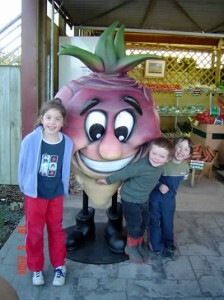 Our famous “Swede Man” with some young friends. Eventually a self-service roadside stand was built to sell the Swedes and in time a variety of vegetables were added. The vege sales increased as the range available was extended. 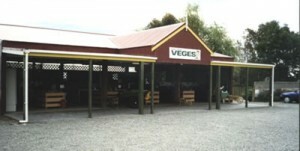 The present Vege Stall was built and opened in March 1993 as the next step to the expansion of the vegetable business, now with staff and plenty of car parking. We take pride in offering fresh Southland produce mainly grown on our farm and sold by local staff who offer friendly service to our customers. We hope you enjoy our range of products and the easy to use and convenient shopping system. The early roadside stall, in 1990.